How lucky is your birthday? This really is the simplest of fundraising ideas. It costs nothing other than a prize for the winner but is pretty reliable in bringing in the cash. Its very easy to understand and run making it a great fundraising idea for kids and perfect for the school fair. It also however makes an easy addition to any other fundraising events all sorts of organisations might decide to put on. Lucky Birthdays is really a simple raffle. The only thing is that people will only have one ticket – their birthday. All you do is sell tickets corresponding to dates in the calendar. But only one ticket for each date. At the end of your event all the birthdays that have been purchased are entered into a simple draw for a prize. Who could resist buying up their birthday to see if it gets lucky. How annoying if it were a winner and you hadn’t secured it for yourself. 365 chances to sell a ticket to someone! What do people do if their birthday has already been sold? Well they could buy a date as close to it as possible. That's right even Rex could get lucky! You could also have a list handy of the birthdays of famous music, film or sports stars. If your own birthday were taken could your hero's birthday be lucky for you? 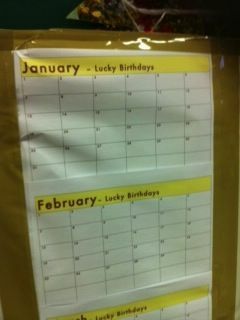 All you need is a calendar on which you can write people’s names when they buy their birthday. This will then clearly show which dates have been taken. You also need some tickets with the same details to be entered in to the draw. Just to make life even easier we have put together a poster, instructions and a simple calendar for you to download and print off. The sheets for the 12 months can be pasted to a wall, board or table top. Alternatively you may staple them together to make a simple book - particularly good if your operation was to be mobile. Tickets – here you can download a handy sheet with tickets on it. Print it off and cut out the tickets. As you sell birthdays simply enter people's details and add to your draw. Has your birthday been taken? Don't despair check our handy list to find a celebrity birthday. Maybe their birthday could be lucky for you. So there you are. A very simple fundraiser. Easy for you to set up and run.....but very hard for people to resist. Give it a go at your next fundraising event!